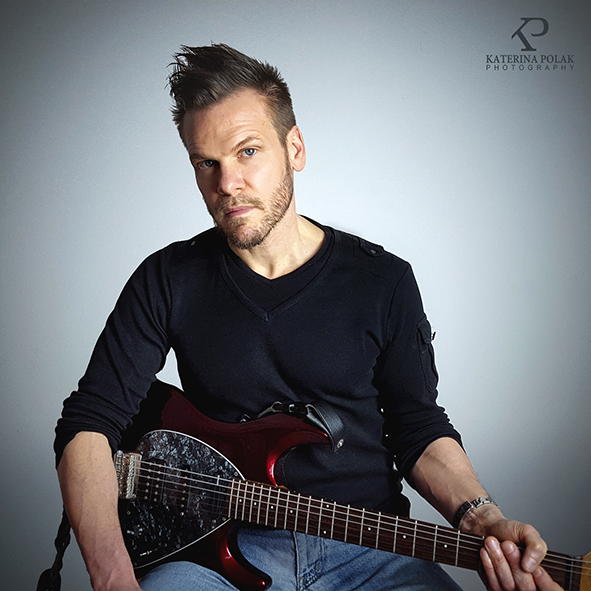 Throughout an impressive career spanning two decades guitarist, singer, songwriter & producer Milan Polak has played with members of Guns n’ Roses, Billy Sheehan (Mr. Big, Steve Vai), Marty Friedman (Ex-Megadeth), Dimebag Darrell (Pantera), Kip Winger (Alice Cooper, Winger), Falco and many others. He was featured in "Guitar for the Practicing Musician" as well as on several CD samplers of the world’s best guitarists (with the likes of Steve Vai, Greg Howe and Marty Friedman). His two instrumental albums "Dreamscapes" and "Guitar Odyssey" received overwhelming praise and great reviews worldwide and stayed in the top seller charts of Guitar 9 for months. In May 2008 Milan Polak was voted one of the world’s 50 fastest guitarists by "Guitar World Magazine". With his third vocal album "Scarred To Perfection" (after "Straight" in 2007 and "Murphy's Law" in 2009), Milan Polak demonstrates once again his skills as a supremely proficient songwriter, singer and multi-talented musician who pushes aside boundaries to come up with some real surprises. Featuring guest musicians Kip Winger (Alice Cooper, Winger), Neil Taylor (Robbie Williams, Tears For Fears), Fabio Trentini (H-Blockx, Subway To Sally, Guano Apes) and Dennis Leeflang (Bumblefoot, Lita Ford, Within Temptation), he has created a hard-hitting and entertaining modern rock album that offers radio-ready song-writing, catchy melodies and a state-of-the-art production. This album will not only delight hard rock fans, it will bring contemporary, honest and sophisticated rock music to a wider audience. One of the most promising rock albums in recent years is awaiting you! Please describe the new album musically and lyrically? I think it’s the perfect descendant of my previous albums in terms of song writing, playing and production. “Scarred To Perfection” features 12 well crafted songs, lots of hooks, some of my best guitar playing, proggy parts and some great performances by guest musicians. Lyrically I tried to get even deeper and more personal than on my previous 2 albums. how does it differ from previous recordings? The album is less bluesy than “Straight" but at the same time not as heavy as “Murphy’s Law". It seems to be the next logical step in my evolution both as a guitarist and singer as well as a composer and producer. The goal was to mature as a song writer and producer. The focus was on finding the perfect balance between good song writing, virtuosity and production. I really wanted to create songs that would appeal to both musicians and the ‘normal’ consumer. Any specific influences towards music or lyric subject? how long did it take to make this album? A lot of time was put into the song writing process. I didn’t want to make a CD with 12 songs where you have one or two good ones and the rest is so so just for the sake of releasing a new album. Each song has a unique story, each song is special. I wrote and recorded all the demos myself and then sent them to Dennis Leeflang, who recorded the drums in his studio. Then I just took it from there. I played bass on most of the songs, then tracked all the guitars, and after that I did all the vocals. I also spent about 2 weeks finding and adding loops, keyboard sounds, etc. I had to relocate in between so all in all it took about 2 years. Dennis Leeflang and I had already worked together on my song “End Of Time” which I wrote for the “Embrace The Sun” Japan Benefit album released by Lion Music. He really has a musical feel for my compositions and so there was little need for explanation. I think the album features some of his best playing. Fabio Trentini and I have been working together for so many years and on so many different projects. So needless to say we know each other well and he always adds that little extra touch. Kip Winger and I have been friends for many years. We played a few shows together, and he also played bass on my Japan Benefit song “End Of Time”. He is a great musician and composer, and always takes my songs to the next level. It’s always an honor to work with him. Neil Taylor is one of the top UK session guitarists. His approach is completely different to mine, and so I thought it would be nice to have him play a guest solo on my album. Fabio Trentini - bass on “Scarred To Perfection”, “Karma” and “Rainbow”, electric sitar on “Karma"
Kip Winger - bass on “You & I"